VINTAGE Sears Roebuck Adding Machine Orange & Woodgrain - Works. Shipped with USPS Priority Mail. I am not an expert on these machines. Item pictured is the actual item that will be received. 1950's BURROUGHS ADDING MACHINE. In the 1950s, Burroughs abandoned manufacture of full keyboard adding machines in favor of ten-key devices. Item is working. This sale is for all seen in pics. Do your due diligence and review the pics, as they represent item from all sides. Vintage 70’s Sears & Roebuck Electric Adding Machine Orange & Wood Grain Retro. Shipped with USPS Priority Mail. Roller works and the manual crank works as it should. Adding machine works.all buttons function normally. Serial number 71-989493. Adding Machine. The machine has ribbon but it's dried up. The bottom of the machine has a neat repair slip taped. 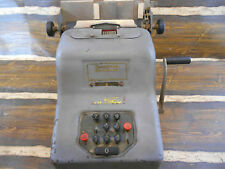 VINTAGE VE-PO-AD CALCULATOR Reliable Typewriter & Adding Machine Corp Chicago Condition: Vintage. Pre-owned. Payment is expected within 2 business days. Thank you for visiting. Complete but missing power cord. Whoever compare AI to human kind is just delusional person. It turns on and functions when you hit buttons. Will probably need a new ribbon. I did not run any paper. Its pretty clean. In later years they were identified as the Series C machines. This model was the first direct subtraction model (introduced in 1937). This unit is in very good condition considering it is likely around 70 years old. Amazing Find! As far as we know it is in working condition, WITH A CLEAN ORIGINAL INSTRUCTION MANUAL, A real piece of history! An early edition check writing machine in nice condition. It is untested and being sold "As Is" as a display item. We try to catch everything & take lots of pictures so you know what you are getting. We're happy to provide extra photos and info. Type : 72-key manual crank adding machine. It includes the original instructions and cover. It is very very clean and is in excellent working condition but does need a new ribbon. Very clean and in good working order, but does need a new ribbon. Has a roll of paper in it. For your convenience, this is included in the price. I took great care in making sure it arrived to you safely! I have listed this item to the best of my ability. Model 8120P. This machine powers up. We promise to resolve your concerns quickly and professionally. LOCAL PICKUP Proceeds are used to support local programs and services. Does not clamp on to feed paper well, either I am not finding the right button or lever or it needs cleaned. Strikes strong, print is a little light as it could use a new ribbon. Includes the unit, stylus, and rough case. Nothing else is included. Serial 73091. From a local estate. Sorry No local pickup. See photos. Good overall otherwise. Operationally I was able to compute using most of the number dials. Style : EC 6000. We look forward to working with you! Made in Japan for Precisa Ltd, Zurich Switzerland. This has been in my family - one owner - for the past eighty years. Ruler along one edge. Includes Original Leatherette Case, Stylus, and Instructions for adding and subtracting. The box was not opened until pictures were taken, as seen in pics. The box shows it’s age. This is a RARE & GREAT FIND its BEAUTIFUL & in EXCELLENT CONDITION. Victor Adding Machine Co., Chicago. Vintage Antique Comptometer Adding Machine Felt Tarrant 1920s, all metal case. in good working condition. It will need a good cleaning, I haven’t done any at all to it, it has oxidation and dirt in the surfaces, but it does work real well!! It weighs 23 pounds, thus the high shipping charge!! One red knob at top is missing. This piece is currently being used for decoration purposes only, I have not tested its functionality. Victor adding machine model 310. Chicago adding machine co.
8 out of 9 keys working, aged wear & tear, button missing on arm. Was my grandfathers adding machine in the 1920’s. Early 1900’s Vintage Monroe Mechanical High Speed Adding Machine Calculator.